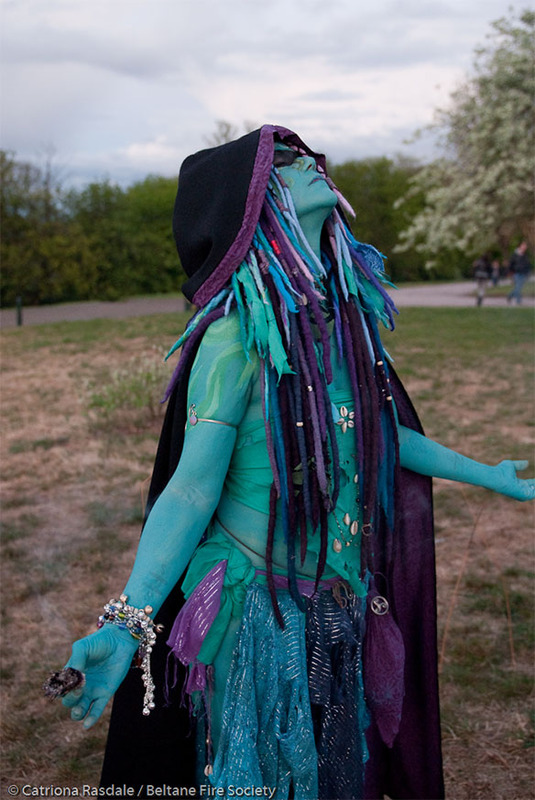 Trisha ‘Iolana is co-organising the Tellers of Bel’s Fire for Beltane 2013. Trish in Water Point 2010 by Catriona Rannoch. Well it’s begun…the ‘run up’ — the controlled chaos that sedately begins in January with Group applications, the waiting and anxiety of waiting, and the Board’s decisions. Following quickly is the weekend that’s just finished – the GO weekend at St. Mags. It’s a time for all the GOs along with the Producer, Tech, the Blues and Health & Safety to meet, bond, share, learn, and prepare for the logistic nightmare that is the Beltane Fire Festival. I say nightmare because it could be: hundreds of volunteer performers on uneven ground in the dark, thousands in attendance (many for the first time and some of them out of their heads) and lots of things on fire. It could be a disaster waiting to happen – but it’s not, or we would not be embarking on year 26. They’ve figured it out; it’s all about creating a team, a clan—a family who, together, share a common vision and work hard for three months to make it all happen beautifully, safely and with much love and passion. The journey of the ‘run-up’ is just beginning. The society drew me in when I witnessed Beltane 2009, and it’s the months leading up to the big night that keep me coming back—the opportunity to take such an incredible journey with a diverse and amazing group of talented individuals who all bring something wonderful to the common vision—the friendships and bonds made and strengthened—the personal and spiritual experiences. Sure we do it for the night – for the performances; and yes, we do it for the photos, the after, the community, the fun, the joys and the laughter. But to get there it takes meetings (lots of them); 2 months of dedicated training and practice; hundreds of emails (and in my case Skype chats); scheduling and rescheduling; coordinating our group, and then coordinating with other groups, the Court and the entire group; discussions, negotiations, and pleas; planning and implementing a weekends away and being present at the busks and the walk-throughs.